Corpus By Rory Clements Review! 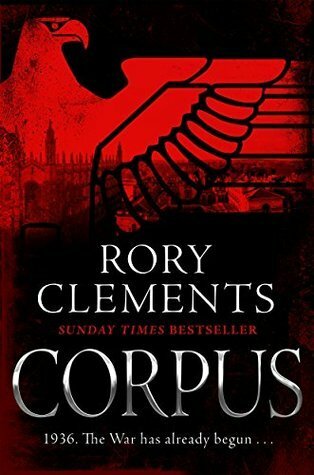 Corpus (2016) by Rory Clements is an absorbing historical thriller set in 1936. A twenty-six year old woman Nancy gets past the Gestapo in Berlin to bring important papers to a Jewish scientist Arnold Lindberg/Schmidt and a few weeks later she is found dead in her bedroom in Cambridge holding a silver syringe. This leads to her death being put down as an overdose or suicide. But not everyone is convinced. Enter Tom Wilde. Brought into the case by his friend and the woman he loves Lydia who was friends with the murdered woman, the history professor embarks on his first case to solve and gradually he finds himself in a world of murder, prejudice, corruption, blackmail, politics, social issues and family entanglements amidst a changing world. One part thriller, one part historical with a splash of romance thrown in, this is an engrossing read. One moment you are reading about the various suspects and all the complex and intriguing web that surrounds the murder of Nancy then you are reading about the various political motivations of all the various characters which is a great study in human nature and then you move to the budding relationship between Tom and Lydia and next thing you are in the midst of historical moments like Edward, Prince of Wales’ abdication and history from the terrible reigns of Hitler and Stalin. It’s an incredibly interesting and jam-packed read. It is quite a long book but it’s worth the effort to find time to read. This is part of a series of Tom Wilde books and this is the first one in that series. The characters and the dynamics are very well-written and there is an array of very different characters in this book with differing viewpoints which of course adds a lot of drama and tension to proceedings. While there was a lot of different characters none of them I identified with in a way of relating to them but I most certainly have met people and know of people like a lot of these characters so there is a very realistic element to the characters. The book is very well-researched so kudos to Clements who clearly put a lot of work into that side of it and the writing is top class too. This book also has a vibe of a critical thinking university atmosphere to it. The characters seem to be characters who think about a lot of things but it seems more in a structural way rather than a feeling way often. Not always but very often and maybe due to that there is sometimes a coldness to the characters but there is people like that so it’s a realistic picture of people who look at things in an analytical sense instead of from the heart. It was fascinating to see the flickers of real emotion coming through in parts but which they repressed with characters like Tom and Lydia. It isn’t particularly light reading and has a thought-provoking element to it and a lot of human dynamics, society and the relationships between people, what they put forward and what they keep back. The mystery is brilliant. I didn’t figure it out and it was a surprise. Not saying they weren’t on my list but it was a long list and they weren’t near the top. So it was very well guarded. The writer does a great job by adding so many people into the story that you don’t know who is involved and who isn’t and great mystery writing mixes the reader up and Clements most certainly wrote a book here that twists and turns over and over. A really great and original read. Excellently written.